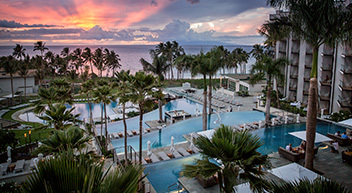 Escape to Hyatt Resorts in Hawaii. Hyatt Resorts in Hawaii is where Aloha is more than just a greeting; it’s a way of life. At Andaz Maui at Wailea Resort you’ll find luxury radiate at every turn. Opt for the endless activities and oceanfront full service spa at Hyatt Regency Maui Resort & Spa. Or feel the energy of contemporary Hawaii at Hyatt Regency Waikiki Beach Resort & Spa. Book a flight + hotel vacation package to Hyatt Resorts in Hawaii, and save at select resorts. Restrictions and exclusions may apply. 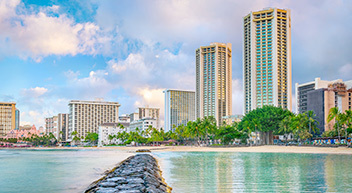 Service from San Jose, CA, to/from Honolulu begins 5/5/19. Service from San Jose, CA, to/from Maui begins 5/26/19. Hotel offer is valid on select room categories. Look for the offer messaging next to your room selection at the time of booking to get this deal. Free daily buffet breakfast is included for two, per stay. Hotel offer is not valid in Regency Suite, Presidential Suite, or Palace Suite room categories. Free daily breakfast is included for two, per stay.